It is not hard to enchant me. I am captivated quite easily by things of beauty, places of mystery, anything that calls to my heart, my soul and my imagination. 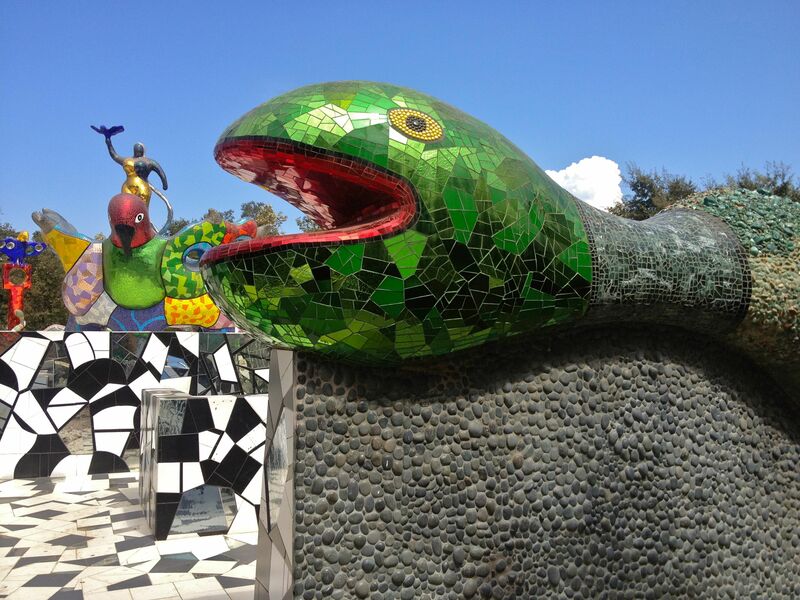 And yet the spellbinding mosaic sculptures of French/American artist Niki de Saint Phalle and her final creation, Queen Califia’s Magical Circle, casts a spell so great that I can almost describe viewing it as a religious experience. 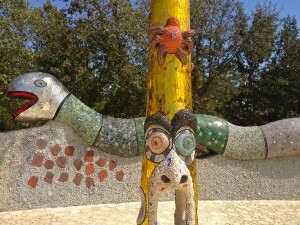 Built over four years in sun-splashed Escondido, CA, about 100 miles south of Los Angeles, the artist worked on this creation right up until her death in late 2002, at age 71. It opened to the public in 2003. 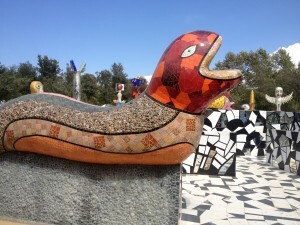 Named after the mythological Amazonian Queen Califia, who was said to rule a land of golden riches, this colorful sculpture park is built with a serpentine wall, 400 feet long, on which gigantic snakes, embedded with glistening tile, uncurl their long bodies in protection of the queen at the center. 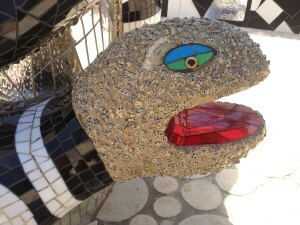 A black and white tiled pathway, broken up with slivers of mirror, leads visitors on a maze-like Alice in Wonderland journey to discover a series of eight totem poles surrounding the central queen. 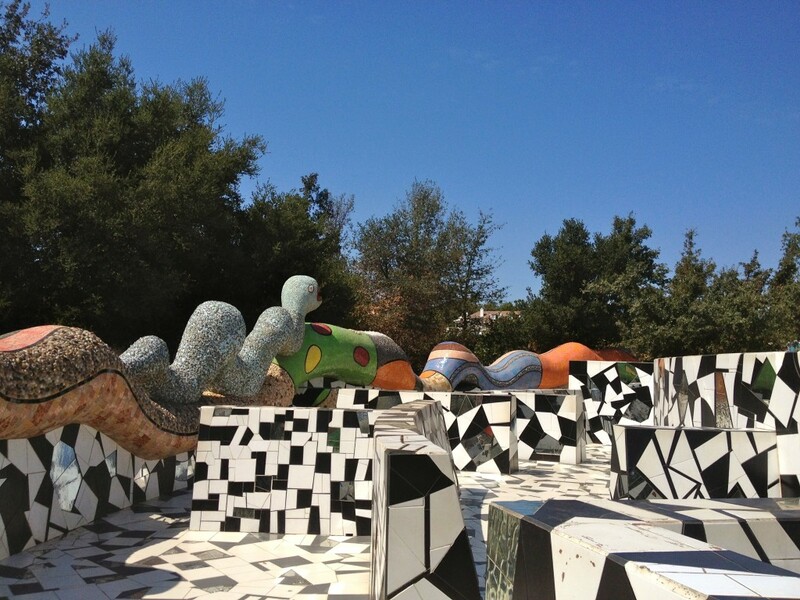 The sculptures range from 11 to 24 feet tall and are covered with mosaic material which reflects, refracts and captures the California sunshine, constantly shape shifting in the changing light. The vibrant blue sky adds the most fitting of back drops. Emblazoned with mystical symbols, this circle is magic in its purest sense. 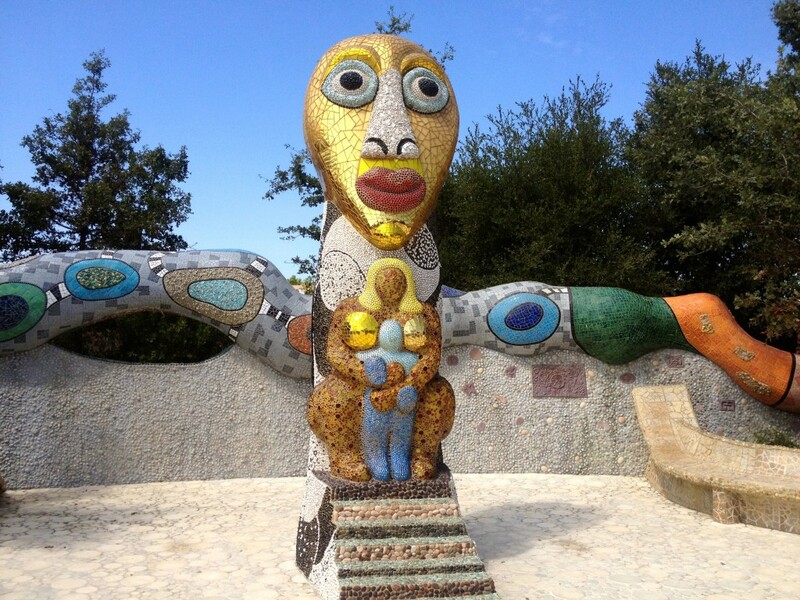 Queen Califia’s Magical Circle combines de Saint Phalle’s unique folk art with a heavy dose of surrealism, creating a landscape that is at once child-like as it is full of symbolism and ancient sorcery. It is definitely a magical visit. 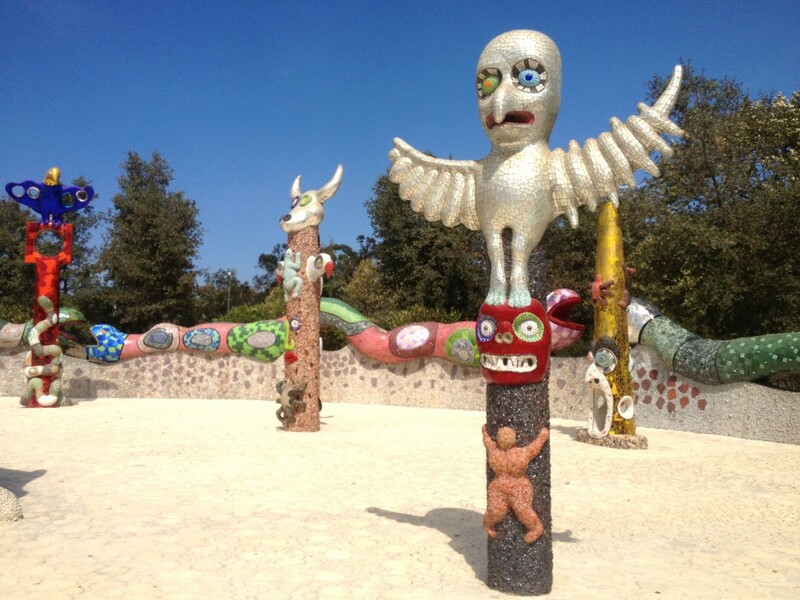 Located within Escondido’s Kit Carson Park, it initially kept free and open daytime hours for over a decade. 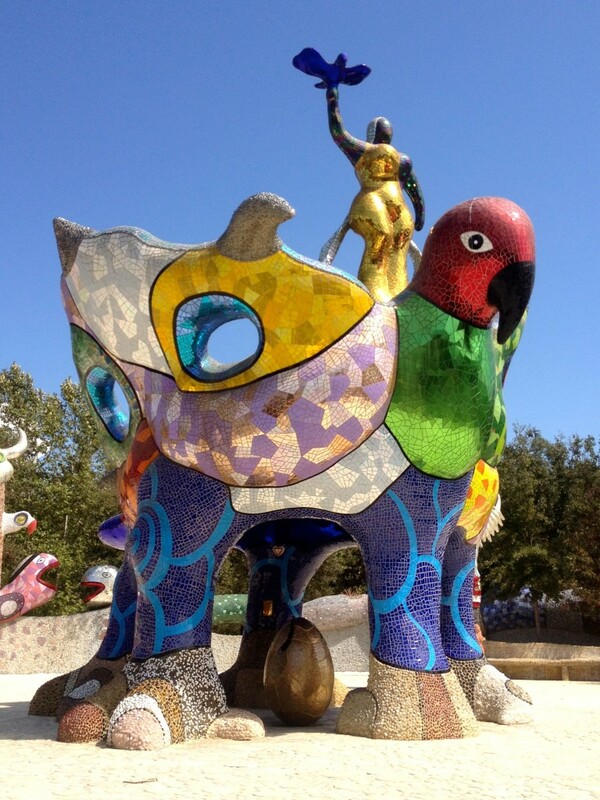 After suffering extensive vandalism, some of it, ironically, by bauble-collecting crows, it was forced to close for over a year between May 2013 to September 2014 while repairs were made. Now that the park has reopened, visits are restricted to supervised appointments. Open hours are now narrowed to the 2nd Saturday of each month between 10am to 2pm. It is best to call in advance to schedule a visit or to check hours before visiting. Kit Carson Park, 3333 Bear Valley Parkway, Escondido, CA 92025; For appointments call (760) 839-4000 or email kowens@escondido.org. 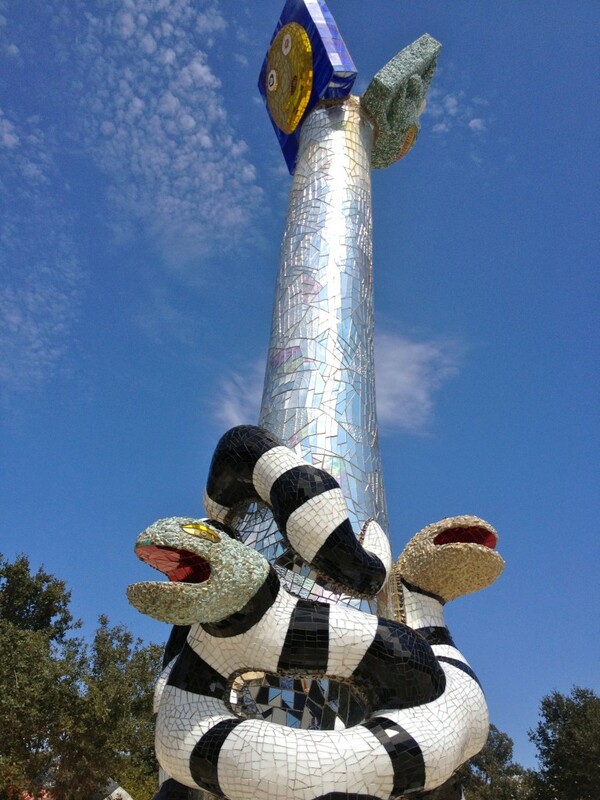 This entry was posted in Art, Attractions, Miscellanious, Offbeat LA and tagged Nik de Saint Phalle, Nikki Kreuzer, Offbeat L.A.. Bookmark the permalink. Magical! Can you come mosaic my backyard black and white during your free time?